Call the Linden Woods expert/specialist realtor today! Hard to beat the value for this size house in Linden Woods. On the corner of two quiet streets. 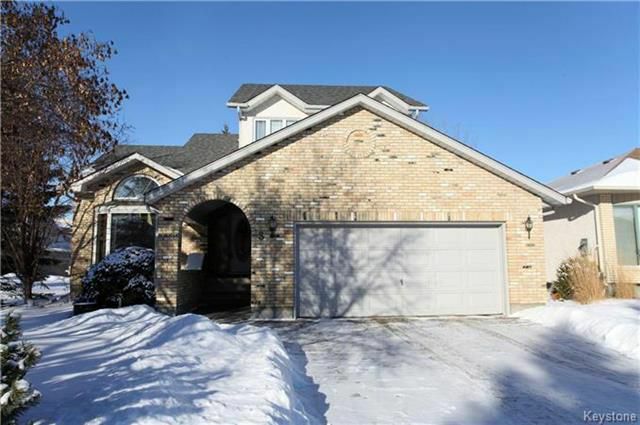 Custom built : open plan living room & dining room w/vaulted ceilings & arched windows. Large & spacious eat-in kitchen w/loads of cupboards, all appliances included, breakfast nook & patio door to deck & backyard. Cozy sunken Family Room w/gas fireplace, Main floor Laundry/mud room, double attached garage. The upper level offers a spacious master bedroom w/built-in window seat, 4 piece en-suite bathroom w/jacuzzi tub, 2 decent sized bedrooms both with vaulted ceilings. The lower level has rec. room, roughed in plumbing for bathroom, & plenty of space for bedrooms #4 & 5! Built-in glass display cases, & perfect office area. Loads of storage room. Straight and solid, believed to be built on piles. This home is situated on a great lot with loads of mature landscaping & perennials. Located close to the community centre, school, & shopping! A Lindenwoods beauty! Call the Linden Woods Expert/specialist realtor today!